We are very pleased to be able to announce the launch of the second title in the “Tunes in the Style” series. 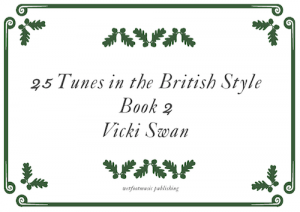 Book 2 has as its focus tunes from the British Isles. A manuscript of 25 tunes (written as duets). Perfect for sharing. Airs, hornpipes, reels, marches and waltzes. All presented in an authentic hand-written style. This is a duet book, so grab your instrument, a friend and have some fun!